For as long as I can remember, I’ve had chapped lips. I’m one of those girls who constantly carries lip balm in my bag, and if I forget it, I go into a slight panic. The problem is, I’d never quite found the best lip balm for my dry lips. No matter how much I reapplied any of my many formulas, the middle of my lower lip is still cracked and peeled. And then, about a month ago, my lips hit rock bottom. After spending a week in sun and salt water on holiday, they were swollen, red around the edges, flaky and stinging. In desperation, I turned to our secret Facebook group The / Clique. I wanted to know if there was some obscure, incredible, miracle lip product I hadn’t heard of yet that would finally put my woes to rest. That’s when one of the women in the group told me about her holy-grail balm, which happened to be only $5 and available at Priceline. I was sold. I went out and bought Dermal Therapy Lip Balm immediately. I really wish I had taken a 'before' picture at this stage, because the situation was so dire. Needless to say, I started applying the balm religiously. For the next 10 hours, I rubbed it in almost constantly. Then in the shower that night, I gently rubbed my lips with my fingers and noticed all the dead skin fall away. I reapplied it again before bed, and hoped for the best. In the morning, my lips were completely rejuvenated. 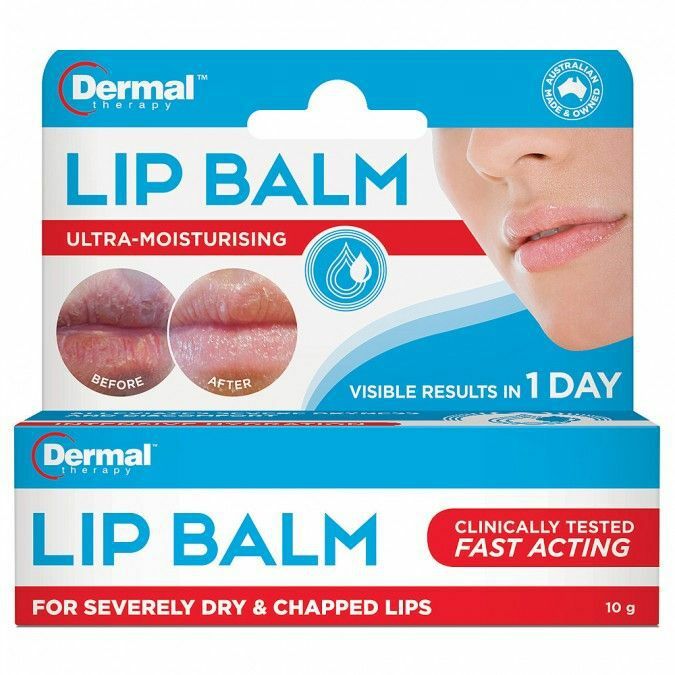 And within another day of applying Dermal Therapy’s balm, my lips were in better condition than I’d seen them in years. They were supple, soft and smooth in a way that I could never remember them being before. Upon closer inspection, I’d say the balm’s miracle properties come down to a small amount of BHA (beta hydroxy acid) in the formula. BHA is a chemical exfoliant, which explains why all the dead skin fell away from my lips within hours. The balm also contains moisturising ingredients like cacao butter and lanolin, and lip-plumping clove leaf oil. Given the balm contains a chemical exfoliant (however minimal), I’d say it’s best to keep this balm for times when your lips really need it, or if you’re like me and your lips are constantly chapped, use it every second night. I now lather on Dermal Therapy before I go to bed every other night, and use a moisturising lip balm with SPF+ like Lanolips Tinted Balm throughout the day to keep them smooth and hydrated.